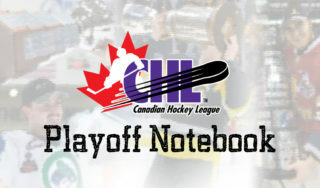 Red Deer, AB – The Rouyn-Noranda Huskies took out a 2-0 lead on the Red Deer Rebels and this time, they didn’t let it get away. After surrendering five unanswered in a 5-2 loss to the Rebels on Sunday, the Huskies held down their two-goal cushion, taking a 3-1 win behind Chase Marchand’s 36 saves. Francis Perron, Martins Dzierkals and Nikolas Brouillard had goals as the Huskies prevailed despite being outshot 37-27 and 26-12 over the final 40 minutes of the contest. The Red Deer Rebels see their season come to an end after hard-working finish that saw them register 37 shots. Head coach Brent Sutter was proud of his team’s play following the loss. A back-and-forth opening half of the first period featured both goaltenders involved in the action. Red Deer’s Rylan Toth took away a quality scoring chance from Rouyn-Noranda defenceman Allan Caron coming in off the point before Marchand stopped Conner Bleackley at the opposite end with a quick blocker save later that same shift. The Huskies capitalized on their first power play opportunity of the night. Timo Meier gathered a loose puck at the top of the circle, faking a slapshot before dishing off to Perron who made no mistake, beating Toth with a one-timer over the shoulder at 10:51. Rouyn-Noranda scored a second just over a minute later as Toronto Maple Leafs prospect Martins Dzierkals walked out of the corner and into the slot, sending a low backhander through the legs of Toth at 11:58 to make it 2-0. After a brief push to start the second, the Rebels found themselves in penalty trouble once again as Rouyn-Noranda took a 3-0 lead on a Nikolas Brouillard point blast. The veteran rearguard stepped into a slapshot through traffic that beat a screened Toth at 5:04 with assists going to Perron and Meier. After spending much of the night having trouble finding lanes to the net, the Rebels finally came through at 13:34 of the second as Luke Philp was on the doorstep to redirect a puck over the goal line. Carolina Hurricanes prospect Haydn Fleury’s fanned point shot made its way through traffic, finding an open Philp who finished the job and brought the capacity crowd at the ENMAX Centrium back into things. Down 3-1, the Rebels earned themselves another late-period power play opportunity, but a big save by Marchand on Evan Polei in the slot and another off Ivan Nikolishin inside the final minute preserved the two-goal lead for the Huskies. Red Deer outshot Rouyn-Noranda 15-6 in the second frame, trailing 3-1 headed to the third. Marchand’s timely saves continued into the opening half of the third period. The overage goaltender robbed Red Deer’s Adam Musil on a point-blank chance from the slot to keep the Huskies up by two. With the crowd behind them, the Rebels put on a valiant push in the game’s final minutes, pulling goaltender Toth for the extra attacker to hem the Huskies inside their own zone for the final three minutes. 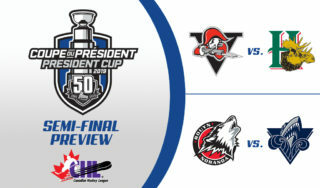 In the end, Marchand’s big saves and countless Rouyn-Noranda shot blocks would prove to be the recipe for success as the Huskies will play to hoist the Memorial Cup for the first time in franchise history on Sunday. The Huskies will square off against a London Knights club that has been idle since Tuesday on Sunday afternoon at 2:30pm MT/4:30pm ET. 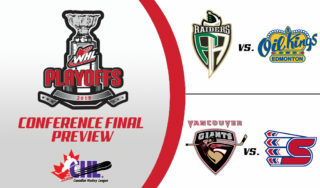 The encounter marks the first time since the Guelph Platers defeated the Hull Olympiques 6-2 30 years ago in 1986 that the OHL and QMJHL champions will square off for the MasterCard Memorial Cup title on WHL ice. 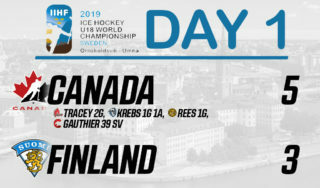 The game can be seen across the country on Sportsnet, TVA Sports 2 and in the United States on the NHL Network.